Gosh it’s great to be back at work! (I’m trying to be upbeat about the end of my vacation.) I’ve missed getting up before dawn, sitting in a stifling hot office all day, and then driving back home in the dark. Really, I have! My coworker Linda likens our job at social services to that episode of “I Love Lucy” where she and Ethel are working in the chocolate factory. Remember that one? They can’t keep up with the candies as they make their way down the conveyor belt so the girls start popping the chocolates in their mouths…? Our job is something like that, but instead of chocolates, it’s paperwork. An endless stream of casefiles of families needing help. If you spend too much time with one client or get too involved with a particular case (or take a few days off!) the work backs up even worse than usual. There are a lot of people looking for help and good management of my caseload is something that has escaped me lately. I think of it like putting out fires. Where are the hottest flames and the most smoke? Who sends out the loudest alarm? Have other departments been called in for mutual aid? You get the idea. Where I run into trouble is being objective about how to spend my time. I suppose I should work first on the case that has been on my desk the longest, and in a good month that’s what I’ll do, but there’s often a contradiction in the work I want to do and the work that should be done. Between deserving and needing. After spending most of this morning returning ridiculous *urgent* phone calls about overdue paperwork, I tried to get some of the really urgent cases off my desk. The family of illegal aliens whose wife and mother was killed in a car wreck last month, the kids ending up in intensive care and none had medical insurance. The teenager who just *discovered* she’s pregnant at six months and hasn’t had any prenatal care. The eldery lady who can’t afford her medicine and pay her rent. In the midst of these real emergencies, the fire I had to put out was that of the single mother who let her (free, on you and me) insurance coverage lapse because she couldn’t be bothered to send back the paperwork. She yelled the loudest today. She and her kids need the help, but are they deserving of my time, before the others? You see why I have a problem. 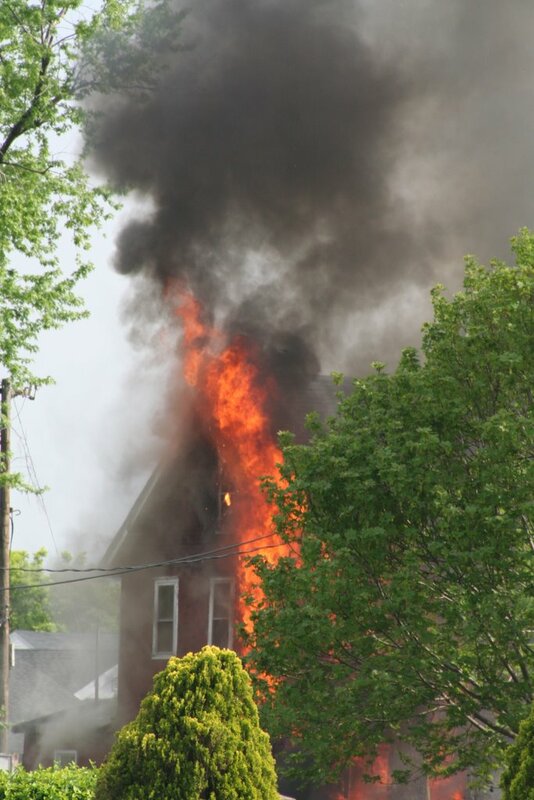 In case you’re interested, the fire pic was taken from my front stoop last May. An old farmhouse across the street burned down while the neighborhood stood and watched. It took the fire department forever to get water on it. Today is the last day of my mini-vacation from work; tomorrow it’s back to the desk and the last few classes of the semester before finals. I haven’t accomplished a single thing in six days off and I’m sort of proud of that! Three and half more weeks of work and school and I’ll have the *real* vacation that I wait all year for. I like being off at this time of year, but find myself disappointed that there’s not more happening outside when I’m home to enjoy it. 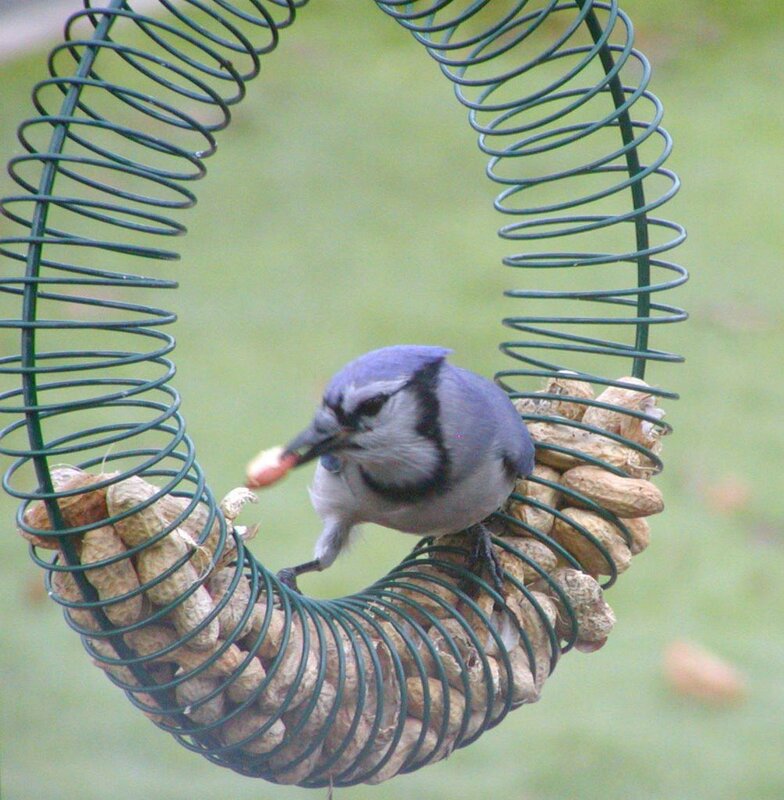 One treat the last few days has been seeing the birds that are visiting the feeders. I’ve been refilling this wreath feeder with whole peanuts from the grocery store twice a week. 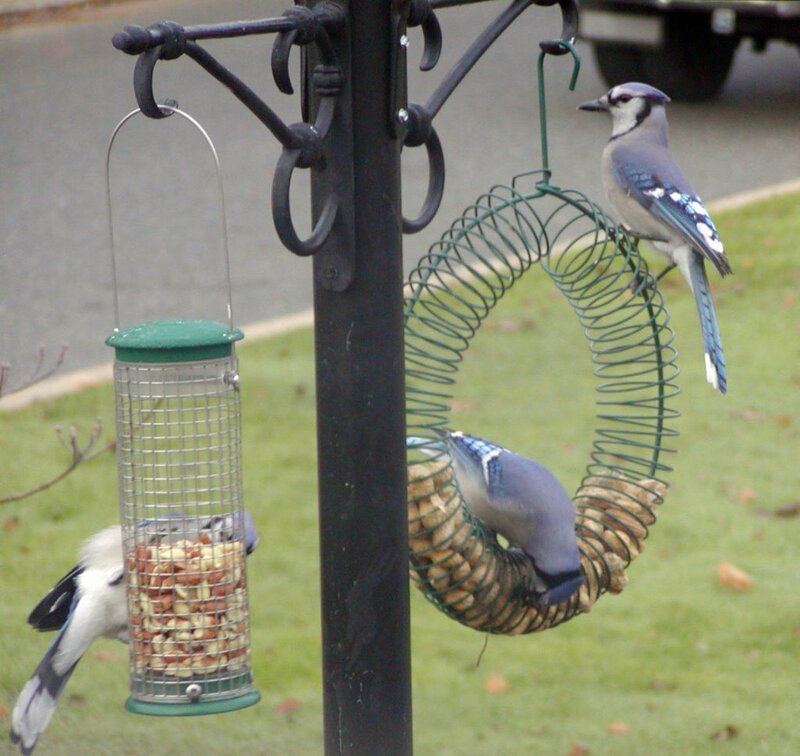 The squirrels take a fair number of the peanuts, but I discovered that there’s also a small gang of blue jays tha t stop by throughout the day. I love blue jays above all the other feeder birds, despite their bad reputation, I think because they are so clownish. The range of blues and violet in their feathers is wonderful to see when the sun hits them just so. Oh and do they love peanuts! Some of them will work a peanut loose and fly away with it, shell and all, to eat or hide elsewhere. The one in the larger photo was breaking the peanuts from their shells and filling up his mouth with three or four before flying away with them. I looked through all of my bird books this evening for a poem to share with these pics and couldn’t find anything that was complimentary. Poets don’t seem to like blue jays. I finally found a poem by e.e. cummings online that I’ll close with. At least I think it’s complimentary; sort of hard to tell with cummings. I went to the garden center around the corner today looking for a rosemary topiary. There was just one left and it was already half way to dead so I left it there. 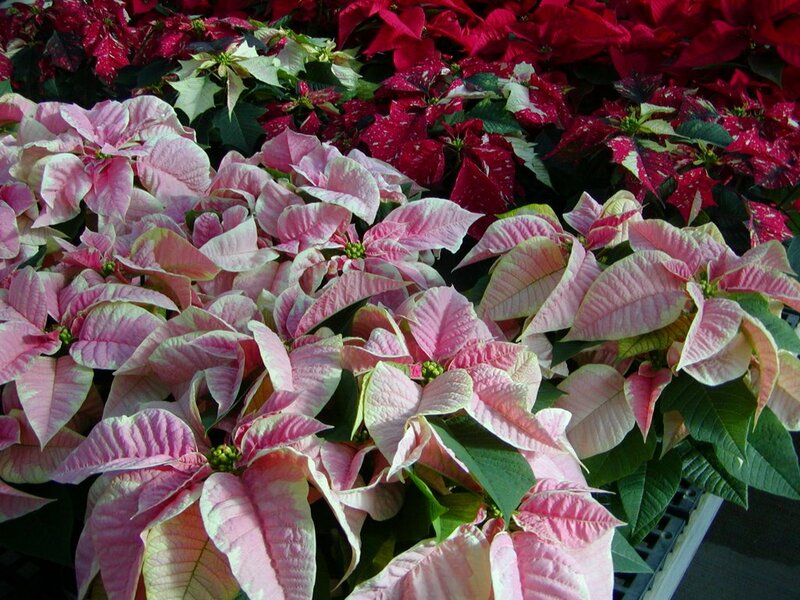 There were plenty of poinsettias though. I left them there too. I like them well enough when they’re massed together like in this pic, but one or two of them don’t look like much. Plus, if I bought them now they’d be wilting and making a mess well before the holidays arrive. Does anyone like these plants? The house could use some sprucing up to help us get in the spirit, but today wasn’t the day to be shopping for wreaths and garlands – it was sixty degrees here! That didn’t seem to stop many of the folks I saw today picking out their trees. They seem to be in the spirit, but it’s still escaping me. I think I need some cold and snow before I’ll feel like it. What about you – have you started preparing for the holidays already? Are you one of *those people* that have all the gifts wrapped and hidden away somewhere? Pet stores are evil places that prey upon soft-hearted fools like me. I kid myself into thinking it’s safe to go in for supplies when I know full well that I’ll be tempted just the same. I’m a responsible person who knows better than to buy an animal from a pet store. I know that it’s important not to breed or buy animals when there are so many dying in shelters. All of the animals that share my home are rescues of one sort or another. The wheekers are pet store refugees. 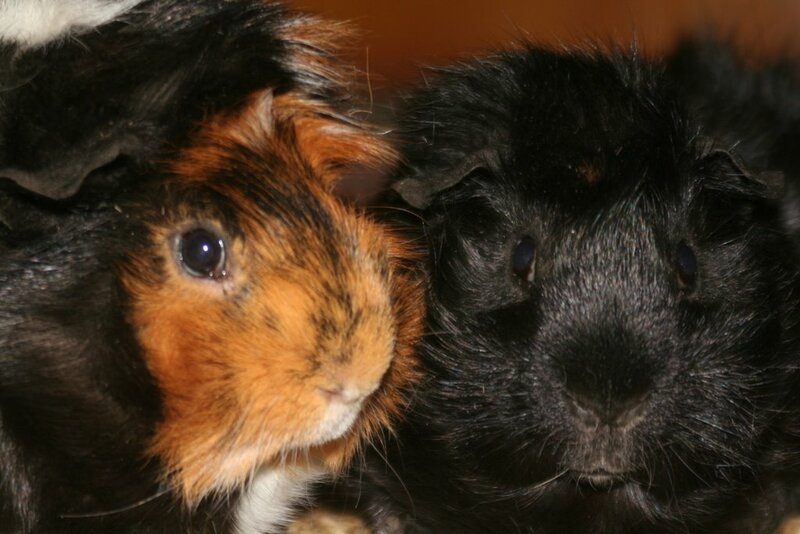 I never wanted a guinea pig, still don’t in fact, but these furry guys have been here for about two years now. They had been bought from and then returned to the pet store where I buy bunny stuff. They were there in a corner week after week with an *Adopt Us* sign on their cage. Who wants rejected guinea pigs? Certainly not the silly people who come along and plop down $200 on a cage set-up and supplies for their kid’s throw-away pet. If they’re going to spend all that money, you can bet they want a brand-new animal, not some used version! So finally I got tired of looking at them there and brought them home thinking they wouldn’t be much more trouble than a bunny. And they’re not any more trouble, but they’re not bunnies, obviously. I prefer bunnies. Bunnies who can learn to use a litter box. Bunnies who don’t have to live in a cage. Bunnies who don’t squeal bloody murder anytime I think of touching them. Bunnies who smell sweet. Lately, the pet store has one whole section devoted to *adoptions* of the animals that have been returned or who were never sold before they got over being young and cute. I stay away from that section. Bunnies are usually too well-represented. I’ve talked to the owner about the twisted logic of her for sale/for adoption scheme, but she figures that she’s doing a good thing by taking the animals back in after she’s sold them. After all, people could just turn them loose or neglect them to death. She’s got a point there, but I would suggest she educate her customers better or make them stop and think before buying. I don’t guess educating people about responsible p et ownership would help her business any, would it? Anyway, I think the wheekers prefer my husband. They don’t squeal nearly as much when he pets them. They don’t run in circles to avoid his hands, kicking up their back legs like miniature bucking horses, when he lifts them out to clean their cage. 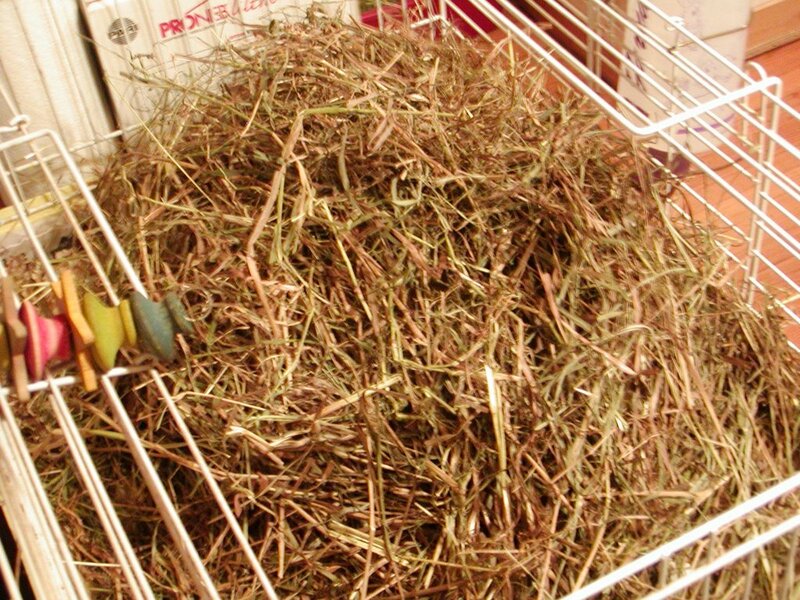 Plus, he gives them a mountain of hay to burrow into each day. If you look closely at the pic at left, you might just see the tail end of one of them hiding under all that hay. They disappear under there for an hour or more each evening after he gives it to them, coming out just in time for their nightly carrots. A love of carrots is something they share with the bunnies. I just wish they smelled as sweet as they look. 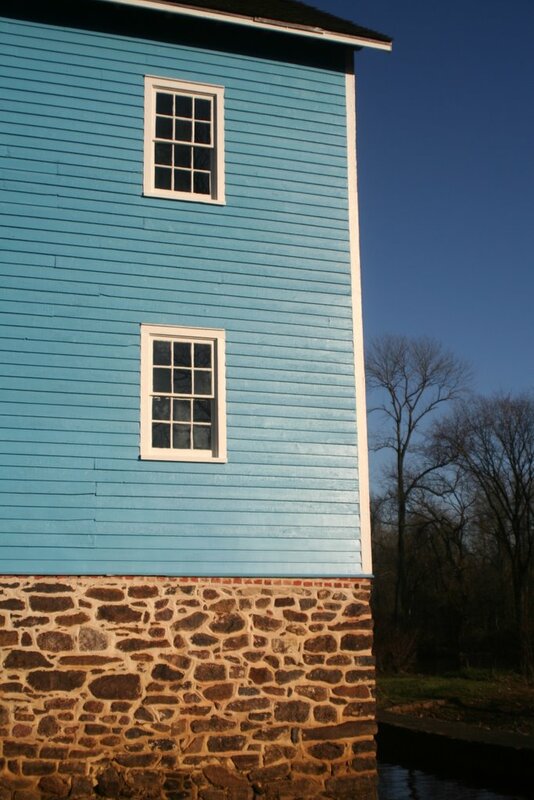 I’ve been seeing pictures of this sky-blue grist mill for years and decided today to visit and see if the building really is that blue. Pretty, isn’t it? Not quite the color of the sky, but close. More like robin’s-egg blue. 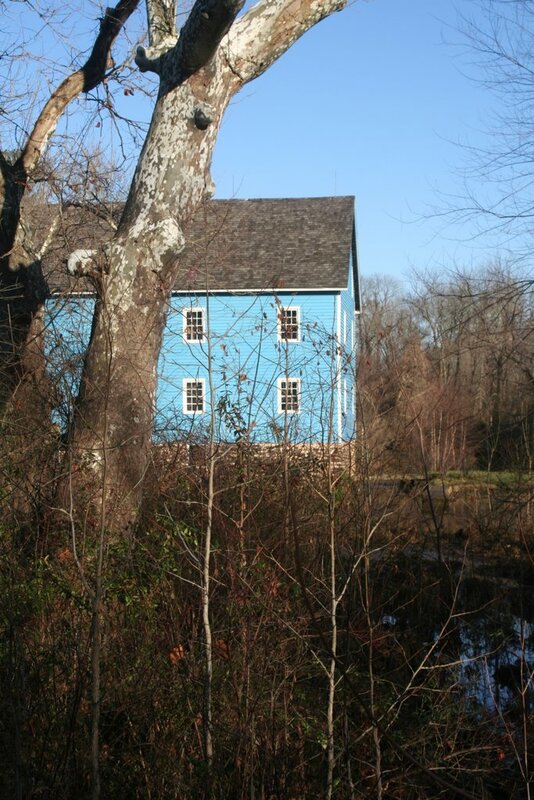 The grist mill is located at Historic Walnford and is now part of the county park system. The site has been recently renovated and includes a Georgian-style mansion, carriage house, and other farm buidlings like a corn crib and cow shed. The mill, situated on Crosswicks Creek, still operates for demonstration purposes and is powered by a turbine rather than an external water wheel as I expected to find. The creek is shallow and slow and could no longer carry goods by boat from Walnford to Philadelphia as it did during the 18th and 19th centuries. It is, however, still a popular spot for fishing and canoeing. The communities surrounding Walnford are some of the most rural in our county. The only time I usually get to this area is when I visit the rescue that I adopt my bunnies from, but I really enjoy the little backroads that travel past horse farms and a winery or two. That’s another NJ surprise – we grow grapes here. Traveling a bit further west today I came across a picturesque old town that I would like to revisit if I ever get in the mood for holiday shopping. What interested me most there today was the old mill pond filled with hundreds of snow geese. Quite a sight and a surprise this far north as I usually drive an hour or more south to see them in the winter at the wildlife refuge near Atlantic City. The only explanation I can imagine for their presence here are the many sod farms in the area. I would love to have a pic to share, but my camera battery died after taking pics at Walnford. Hopefully I’ll find the snow geese again on my next visit. There are more pics of some of the other buildings at the Walnford link above and I may post a few from the interiors on another day. I wonder if all that eating I did yesterday has affected my ability to think straight and do anything besides lie on the couch like a slug. Maybe it was watching tv all afternoon that has numbed my brain. I have nothing but leftovers to offer up this evening. The pic at left is a leftover from last weekend and a short walk with Buddy to the local woods. Not woods at all, really, as you’re never out of earshot of the road and anymore it seems more like the hangout of the local delinquents than the *nature trail* that it purports to be. The last time I visited with Buddy we came across a group of teenage boys with paintball guns. 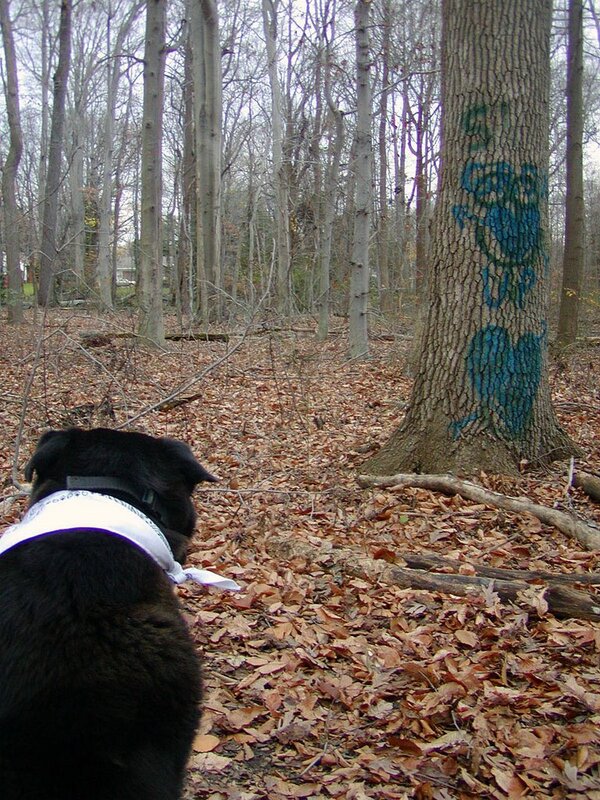 This time it was graffiti painted on the trees. A depressing sort of walk on all accounts. I put Buddy in the car and drove over to the development across from the woods because the walk there and back would’ve been too much for him these days. The screech-owl box that has been productive in the past had its top torn off – destroyed and unusable for roosting, even. The woods were wet and muddy and we both made a mess of the car on the way home. The one thing that made me smile was a father with a brood of kids in tow. The kids were racing along ahead of him, jumping through the fallen leaves and in and out of the puddles on the muddy trail. He was laughing and didn’t even scold his daughter for climbing up a low-limbed maple that overhangs the creek. They stopped to chat for a bit as Buddy and I had a rest on a fallen log. Buddy almost let the kids pet him before shying away behind me. Some things don’t change, no matter how old he gets. Today I spent nearly an hour cleaning and medicating his ears. We’ve been struggling to get rid of an ear infection for more than a year – we do antibiotics and medicine twice a day and I think it’s gone away, but invariably it comes back worse than the last time, it seems. He’s been a trooper about it, but today I realized we need to do something more. My old man dog doesn’t deserve to be so uncomfortable all the time. Not to mention he wakes me up all night with his head-shaking. I’m scared about putting him under for the deep ear cleaning that our vet had recommended once before, but I don’t know what else to do to for him, short of cutting off the offending smelly ear! Tomorrow I hope to get out in the fresh air and walk in the woods and clear out some of the cobwebs. There are lots of leftovers to walk off. 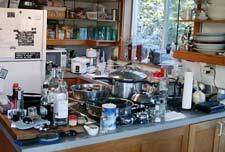 The kitchen looks something like this – like a small tornado hit – you get the idea – but there’s a pumpkin-praline pie baking in the oven and a pumpkin cheesecake still to make. The DH is peeling chestnuts for our favorite casserole with Brussels Sprouts. The bunnies are attention-deprived. I’m feeling thankful that I don’t have a turkey to cook also. 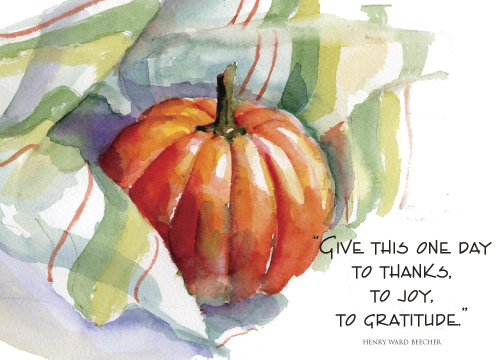 Happy Thanksgiving to all. Off to attend to that pie in the oven. I found myself wandering around an old cemetery today on my lunch hour. I had gone intending to take some photos of Old Tennent Church, founded in 1692 and used as a temporary field hospital during the Revolutionary War. Instead I wandered around looking at the gravestones, many of which are from the 1700’s. The church building was closed, but some of the pews are said to be scarred from the surgeon’s saws and the blood of soldiers who died here during the Battle of Monmouth and are buried in the churchyard. There are two huge old oak trees that frame the entrance to the church, set on a hill. This curiosity about gravestones and cemeteries comes in part from thinking about them the past few days. I’m wondering what role they play in the mourning process for the people left behind. My closest friend, who lost her dad in the last year, had the *unveiling* ceremony for her dad’s monument this past weekend. It’s the custom in the Jewish religion to hold this ceremony close to the one year anniversary of a person’s death. I guess it’s supposed to be one of the last steps on the path of grief for her. I’ve tried to be with her as she learns her way without her dad beside her. I’ve tried to give her the chance to talk often of her dad and share her grief with someone who understands it, but it’s been hard to see her suffering the most personal loss of her life and not be able to do more than listen. I hope that she’ll continue to find strength in the practice of her faith and in her family. 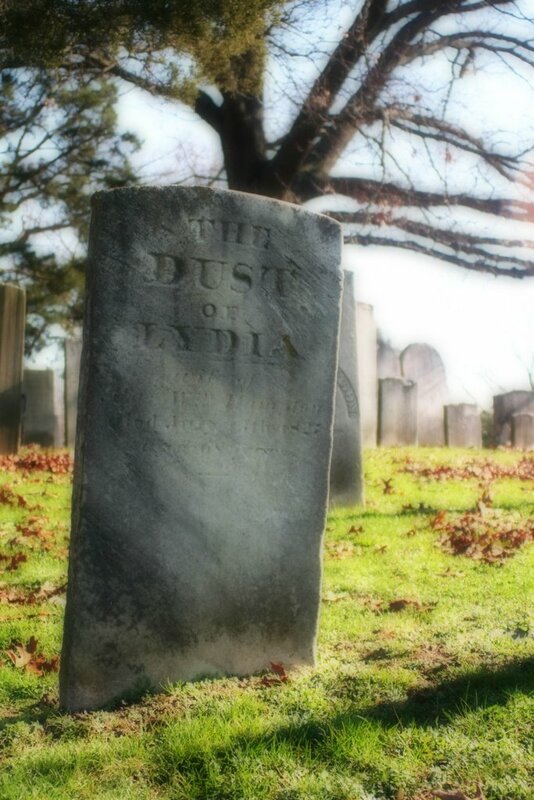 I know how difficult it must have been for her to see her father’s name insribed on the gravestone. Perhaps the finality of that sight is the reason for the Jewish custom and the delay in seeing the monument. Maybe soon she’ll find a way to see beyond his death, to the impact of his life and his love, and she’ll come to understand that his values and ideals continue in her. How would you like to live in a town that decks itself out like this for the holidays? Lucky me, I do! Technically, I live in the next town over, but Red Bank is the place that I consider home. I don’t really feel part of the community in the town where I live, but feel as if I’m among friends when going about my daily grind in Red Bank. There’s always a familiar face and I know the best coffee shops and where to find a good bargain in town. My husband was born and raised in Red Bank and has worked for the Public Works Department there for most of his adult life. He fixes the police cars and fire trucks (and is a volunteer fireman there), picks up the leaves in fall, and plows the snow off the streets in the wintertime. If you want to know the truth, I think the town would crumble and fall without him, at least judging by the number of calls he gets to go into work at 3 am to fix something. Another *job* that my DH has is to decorate the town for the holidays; he’s done this for as long as I can remember. During November he works his regular job during the day and then spends a few hours each night and most days on the weekends stringing lights and hanging wreaths around town. By the time Thanksgiving comes and the work is done he’s about had it with decorating, but that is when we start the job of decorating our own home for Christmas. Some years he’s full of energy and goes all out at home, other years we’re lucky to get a tree up and decorated before midnight on Christmas Eve. This year, my DH decided that he wants a break and won’t be doing the decorating in Red Bank. He says he’s tired of working out in the cold and the rain. It’s strange to have him here now, when he should be out there, making the town light up so pretty. Already tonight, as the deadline nears, the phone calls are coming for him to help, or to fix some machine that’s stuck in the road blocking traffic. I’m sure he won’t be able to resist helping, for long. The image above is a scan of a Christmas card from a few years ago. A local artist paints beautiful scenes of the town at Christmas and turns some into cards. 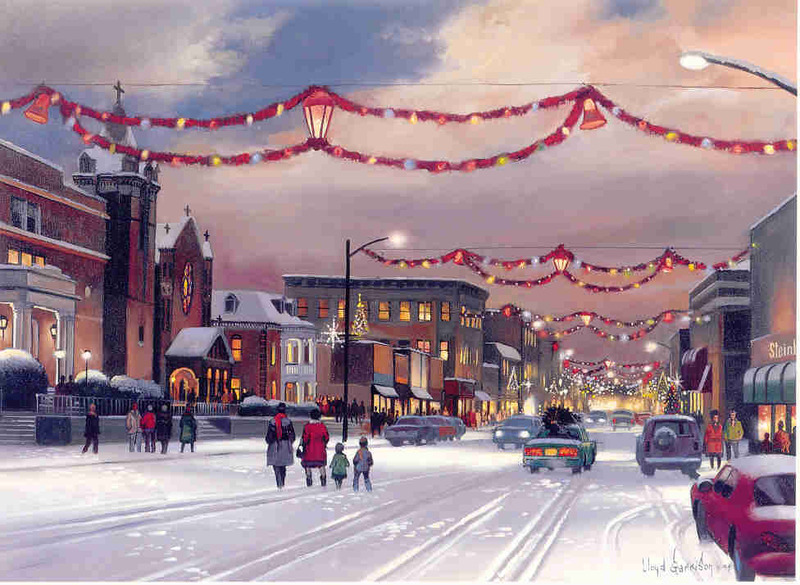 One day I’d like to be able to afford one of his paintings of a Christmas scene of our hometown as a gift for my husband. Something beautiful to remember all of his hard work by.